The stock prices of the highly regarded industrials have dipped recently. Is it enough to make them good values? The recent stock market volatility is likely to be creating some entry points into high-quality companies for long-term investors. With this mind, I thought I'd take a look at industrials Illinois Tool Works and 3M Company. Both stocks have an enviable record of margin expansion and profit growth, and both have double-digit EPS growth in their sights for the next few years. Is it time to buy them? And if it is, which stock should you prefer? Both companies are very well run, the midterm plans of Illinois Tool Works and 3M Company. imply both companies can achieve double-digit earnings growth. Here's a summation of their projections for the next few years. There's no doubt that both are good companies, but are they good investments on a risk/reward basis? One way to look at valuations is to compare forward valuation estimates -- in this case, analyst consensus for one year ahead -- with historical averages. 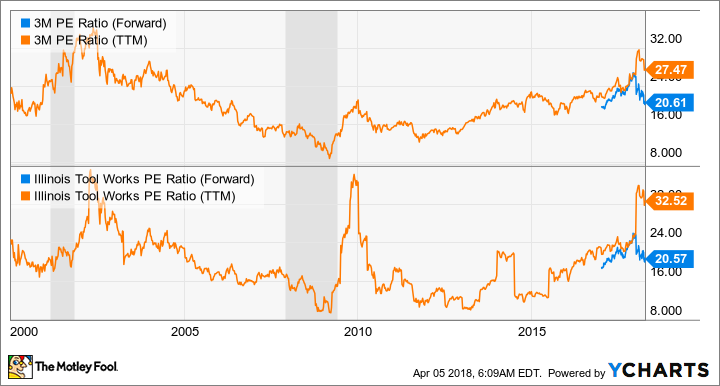 As you can see below, both stocks are trading at forward price-to-earnings ratios of around 20.5, and outside of the periods following recessions, the stocks look expensive compared to historical P/E valuations. MMM PE Ratio (Forward) data by YCharts. Frankly, it looks like both companies are going to have to have a blemish-free 2018 in order to merely make their stocks close to fairly valued. In a nutshell, I think the odds of achieving analyst estimates for the next few years are pretty much 50-50. On the positive side, the industrial economy looks set to improve -- that's good news for both companies' cyclical industries like welding, construction products, and polymers and fluids (Illinois Tool Works) and industrial abrasives/adhesives, safety equipment, and electronics (3M Company). Moreover, both companies have a history of margin expansion on their side, with Illinois Tool Works continuing to expect margin expansion from its self-help enterprise initiatives. On the other hand, there's downside potential as well. Outside of the risk of the economy slowing, I have three concerns for 3M Company and two for Illinois Tool Works. First, both companies have significant automotive production exposure -- 23% of Illinois Tool Works revenue in 2017, and 3M's industrial segment (which has significant automotive exposure) generated 34% of 2017 revenue -- and it's a market that appears to have plateaued. 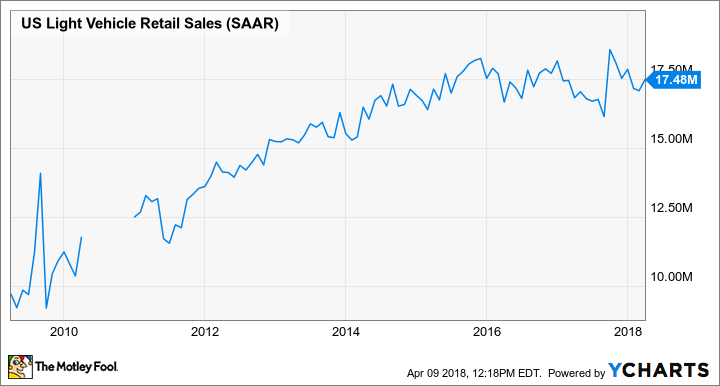 Despite a jump in March, U.S. light vehicle sales are now only growing at a 17.5 million seasonally adjusted annual rate -- as you can see below it's a rate first breached in the middle of 2015. US Light Vehicle Retail Sales data by YCharts. Second, both companies have been expanding margin but are coming under pressure from rising material costs and haven't been able to increase pricing as much as might have been hoped. In short, margins have been growing because volume growth has been strong, rather than any increase in pricing. As you can see below, 3M's organic sales growth has largely come from volume increases. Illinois Tool Works reports metrics in a slightly different way, but as you can see below, margin expansion has been coming from volume growth and enterprise initiatives rather than an improving price/cost dynamic. Data source: Illinois Tool Works presentations. bp is basis points, where 100 bp equals 1%. The problem with relying on volume growth for margin expansion is that if the economy slows and volumes contract, then margin could come under significant pressure. Third, speaking at the recent Bank of America global industrials conference, 3M COO Mike Roman indicated that first-quarter 2018 organic sales growth would come in toward the low end of its full-year guidance for 3%-5% growth. He cited slow automotive markets as one of the main reasons (the other was consumer electronics). This is a sign that 3M's full-year automotive sales growth target could come under threat. Despite the recent pullback in the market, I think both stocks still aren't quite buys yet. Their forward valuations don't make them appear to be good values and I think the risks to their mid-term earnings guidance is a toss-up Of the two, Illinois Tool Works is probably better on a risk/reward basis, but for now, it's hard to make a compelling case for buying either stock.